There are many issues that adversely impact students in schools nationally and in middle Tennessee. In Belmont’s Education Department, students work with faculty to unpack these issues and understand how to better build on students’ strengths while supporting and advocating for children, families and communities. 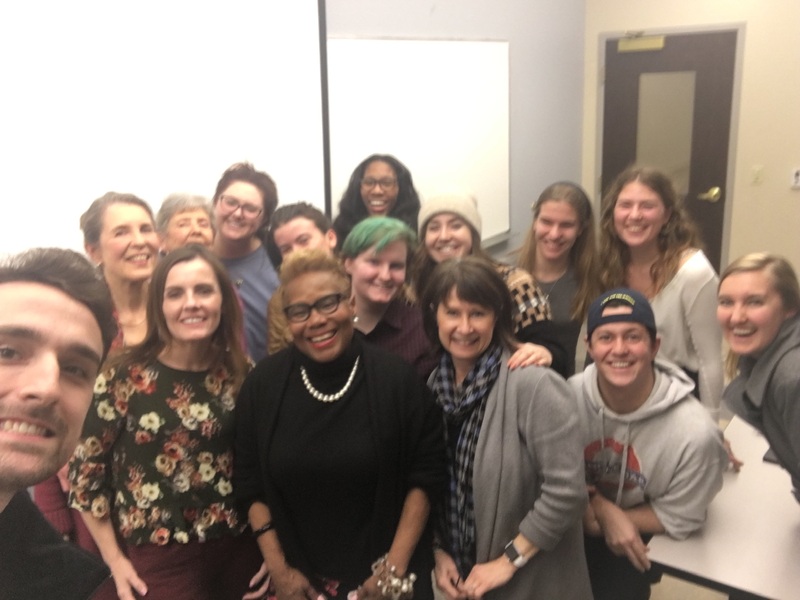 Students in Dr. Sally Barton-Arwood’s Organization and Management of Multicultural Classroom Communities course recently met with members of Nashville Organized for Action and Hope (NOAH) to talk about how discipline disparities negatively impact the success of Black students in Nashville. NOAH is a multi-racial and interdenominational faith-led coalition, comprised of congregations, community organizations and labor unions that works to give voice to traditionally marginalized people and acts as a unified voice for faith and justice. Linda Robinson, Phyllis Sells, and Liza Ramage are members of NOAH’s subcommittee on criminal justice, and they work specifically on school discipline issues. In Metro Nashville Public Schools, African American students make up 44% of public school students, but represent 77% of suspensions and expulsions. These disproportionalities are evident in schools across our nation, even though many of the behaviors that result in suspension are minor infractions for which other students, who exhibit the same behaviors, do not receive suspension. Guests from NOAH shared additional statistics that highlighted the fact that children of color are being pushed out of schools, into the streets and into juvenile justice systems – what is now known as the School-to-Prison Pipeline. A main focus of Barton-Arwood’s class is the pipeline and issues related to mass incarceration, while also teaching how to engage in advocacy and strategies that educators can use to disrupt and dismantle the pipeline. Jevonna Holbert, a senior majoring in sociology and minoring in education, is very interested in these issues and plans to pursue a career in law. After listening to the information from NOAH she said, “My reaction to the statistics helped me understand how my community and peers are impacted and effected by the inequity of the School-to-Prison Pipeline and encourages me to commit my life’s work to dismantle the system.” Jevonna and fellow senior Sarah Evans will be doing a research symposium presentation later this spring on the pipeline.